Vive le Roi! Royalists and Catholics March Across Paris as ‘Globalist Bankster’ Macron Takes Office. In a city more accustomed to leftist marches, the sight Joan of Arc parading through Paris on a white horse made for an unusual spectacle, Sunday afternoon, as hundreds of Catholics, royalists and nationalists took to the streets of the French capital to honor the saint and to call for national revival. 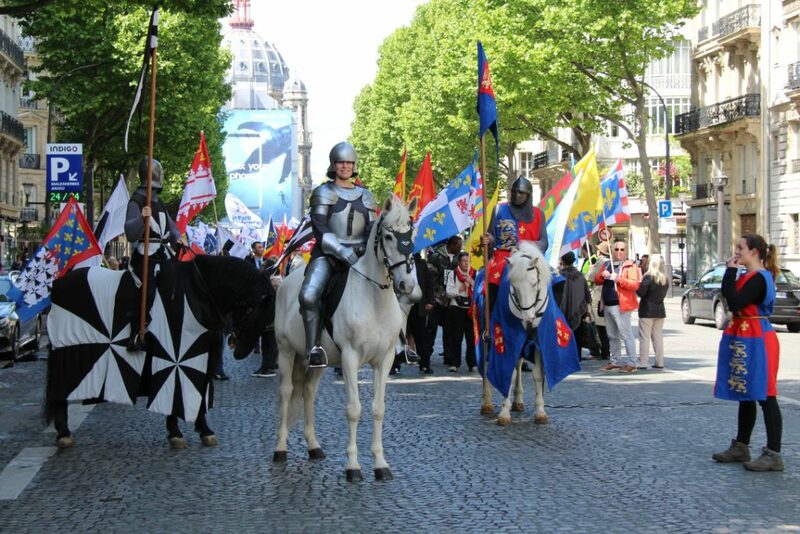 Flanked by knights in armor, an actress playing the national heroine headed the parade organized by Civitas, a Catholic nationalist movement recently restyled as a political party which will field candidates in next month’s French legislative elections. Also present were members of Action Française, the longtime royalist movement, little known outside of France, which seeks to reinstate the monarchy and install a king as head of state. Action Française had held their own march, one of several to take place in the capital, hours earlier. Barely a mile away, the pomp and ceremony were continuing for the inauguration of the ‘king’ of the next five years, Emmanuel Macron, the French Republic’s newly elected president. Macron, fresh from his investiture at the Elysée Palace and a parade along the Champs-Élysées, was attending an official ceremony at the Hôtel de Ville, meeting Paris’ socialist mayor, Anne Hidalgo. Macron’s victory, the marchers heard, was a grand manipulation, at the hands of a media concentrated in the hands of the few, which had duped the public into believing he could revive the country. Rather his presidency would mean five more years of ‘grand replacement’ immigration, suppression of political dissent and continued measures to replace the traditional family with alternate models. It would mean a further five years of the erosion of France to the benefit of a stateless, globalist ideology, Alain Escada, the head of Civitas told the crowd. The cortège was delayed for a time on its final stretch as a car waited outside a majestic address on Rue de Rivoli, surrounded by press on motorbikes and television news crews. It was former president, François Hollande, visiting what would be his new office. He emerged and sped off, pursued by the awaiting media, moments before the arrival of the ‘knights’ leading the parade and the sound of a booming-voiced priest invoking Joan of Arc to deliver France. 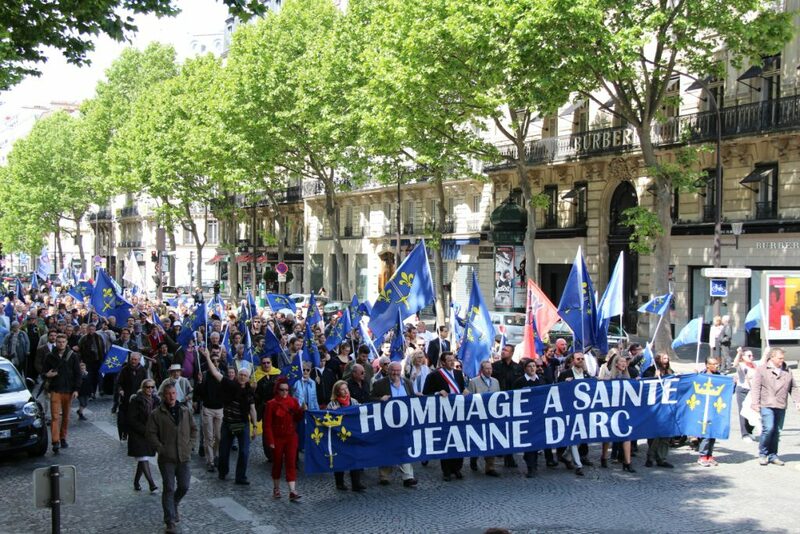 The march, unashamedly Catholic and patriotic, flowed peacefully through the streets of the capital, commencing from Place St. Augustin in the city’s chic 8th arrondissement, passing historic landmarks along its route to the Place des Pyramides before speeches were heard by the statue of Joan of Arc. There was no counter-demonstration, the march drawing more curiosity than anything else. Several cries of ‘fascists!’ could be heard from a handful of onlookers near the end of the route. One man, triggered upon seeing a river of royal insignia and flags, hysterically screamed the word ‘Europe’ whenever ‘France’ was mentioned. On the opposite side of Rue de Rivoli, two men kissed between cries of ‘fascists!’ in a frustrated attempt to provoke the marchers. It caused little scandal. As in the early 15th century – the time of Joan of Arc – the country was fractured, the Civitas leader told the crowd in his characteristic Belgian accent, with its people looking on in desolation as their country was invaded. Much worse, however, the millennial nation was facing its current threats as a largely dechristianized country. Having lost the faith of their baptism, they were sinking into immorality, disorder and cowardice, to which the only solution would be to rechristianize the country, following the example of Joan of Arc and the heroes of the past; St. Geneviève, credited with saving Paris from the invading Hun armies in the fifth century, and Charles Martel who stopped the Islamic expansion into Europe at the Battle of Tours in the eight. ‘’When an authority works against the well-being of the people and imposes decisions against the general interest, it is always a duty to disobey and resist’’, Escada told the crowd before a stirring speech from firebrand priest, Father Xavier Beauvais, a member of the traditionalist SSPX (Society of St. Pius X) in which he called for those present to take courage from the example of Joan of Arc, before closing proceedings with a prayer and blessing. 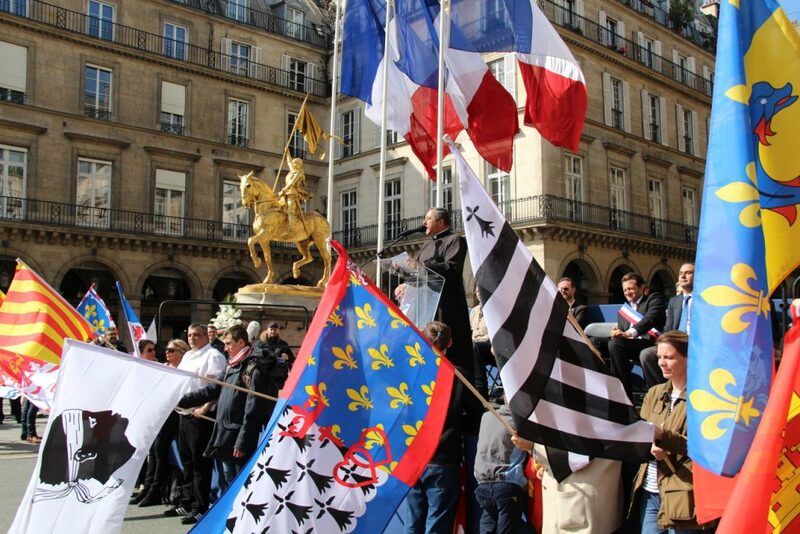 The march brought together representatives of various nationalist and traditionalist movements, including Comités Jeanne, a movement launched by Front National founder, Jean-Marie Le Pen, and Le Parti de la France; a mélange of political forces united by what they see as the gravity of France’s current situation. French royalists are more numerous than most people realize, and their ranks extend far beyond the noble families which managed to escape the guillotines of the 1790s. Just under one in five of the French population are favorable to the return of a king, a number which Sunday’s marchers expect will have increased by the end of Macron’s presidency.